Lake Bloomington is a family friendly, man-made 635 acre lake located in Hudson, Illinois. You might be surprised just how many residents and visitors of Bloomington-Normal are not familiar with this recreational dream located right here in central Illinois! We here at BN Realty can’t write another guide until we let our readers know about what Lake Bloomington has to offer. Lake Bloomington is a very short drive from the Twin Cities. It can be accessed by taking I-39 North to the Lake Bloomington exit and proceeding east on Lake Bloomington Road (2500N) for 4 miles. 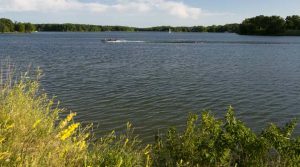 The lake has 18.5 miles of shoreline and was built in 1929 to serve as the main source of potable water for Bloomington. It is maintained by Bloomington’s Water Department. There are over 200 residential sites and various public parks to host activities in the area. Here is the Lake Bloomington map. Lake Bloomington is about 15 miles north of Bloomington but can seem like a world away. Just ask some of the visitors that easily spend an entire day on the shore, in the water or in a boat on the lake. Lake Bloomington was named one of the National Fish Habitat Partnership’s “Waters to Watch” in 2014. If you enjoy fishing, you can find walleye, crappie, large and smallmouth bass, and hybrid striped bass. Fishermen can use two pole and line fishing only, no trot lines, jugs or bank poles. There’s no better way to put dinner on the table than by bringing it home fresh from the lake. If fishing is not your idea of a fun day in the sun, there are plenty of other ways to spend your time at Lake Bloomington. There is a public boat ramp that you can use with a boat that you own or rent. The Mucky Duck Marina is a privately owned marina located in Hudson. This marina offers dock space rentals to individuals. They can be reached by calling (312) 343-4875 or emailed at muckyducklakebloomington@gmail.com. They even offer boat rentals on site! Keep in mind that there is a fee to use the ramp and that all boats must have a current state and City of Bloomington license. The application can be found on the City of Bloomington’s website. The parks surrounding the lake are for general day use from 6 am until 10 pm daily. They offer picnic tables, shelters, grills, playgrounds and other amenities. The rules to follow are: no swimming or wading, no open fires, no alcoholic beverages, no overnight camping, no vehicles off the roadways and no littering. If you can follow these simple rules, we think it’s time that you start filling up the weekends on your summer calendar with a few trips to the parks at Lake Bloomington!